Prime Minister Barrow has also commented on the incident speaking quite firmly against the action taken by the villagers to detain Myles. According to the PM, what occurred at the hands of the Maya community is inexcusable as Myles’ human rights were also violated during the false imprisonment. We will continue to follow this developing story in our subsequent newscast. Look who is talking the biggest bigot and racist in the country just look at the gov out of 1500 jobs only 12 people are non black if this isn’t racism at its worse I don’t know what is.unu Betta vote right this time Mayan people. The biggest racist of all..Mr. Myles have a gun and threaten to use it against the villagers…So this means you tolerate violence…Shame on you Hitler Barrow…Your days are over…Hulse said it clear “Dean Is an arrogant fellow”…And another thing you don’t even know the ruins in your country….All you care is the PetroCarib money and want to be in the History Book…The people are not fool anymore….They will vote you out this coming election…Call Election soon you big thief…. 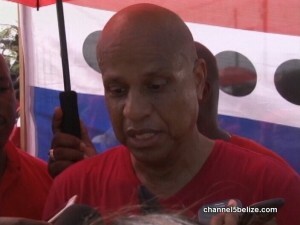 Talking about unlawful imprisonment, members of the Belize Police Department are doing that everyday. If I spell out everything that is happening, the government don’t have the money to compensate everybody. When it comes to laws, they are made by lawyers in politics mostly to serve their own interests. Dean Barrow can make his own laws for political purposes, which don’t work for the good of the people most of the time. The Mayan villagers make their own laws based on common sense. If Mr. Myles was threatening to use a gun against the villagers, the villagers have the legal right to defend themselves and prevent a crime from happening. The law of self defense is in the Laws of Belize, and based on what I am reading, the villagers exercised that right without breaking the laws of Belize. It appears to me that Dean Barrow has conveniently forgotten about the laws of self defense and peace in this particular case. He has been trampling on the Mayans from the time I got to know him – and there is a lot more I know that I am not ready to release yet about Dean Barrow and the UDP. I say sue the Alcalde Association. Rod and Hasaan you both are IDIOTS!!!!! as far I am concern we need to send all those Mayas from Maya Mopan in Belmopan to their communal land in PG since there is the only place you belong . I am sorry fu tell unu two this VIP will win two seats in the house before PUP ever win an election again. I made my first comment based on what seems to be mostly one side of the situation. I found what appears to be another side elsewhere. I have lived in almost every part of this country and I have seen the good and the bad in every race. I am happy to say that the majority of people in every race in Belize are good. If the allegations against that chairman is true, I believe it is because he does not know about people of other races. He probably has never been out of his village.